What Is the Amazon Echo Input and How Does It Work? The Echo Input is a variation of the Echo Dot device that includes microphones for receiving Alexa voice commands, but eliminates the built-in speaker. So in order to hear Alexa voice responses and enjoy music streaming and other features, you'll need to attach it to a spearker or some kind of audio system. To find out if the Echo Input right for you, let's check out what it can do and how to set it up. Connects wirelessly to Bluetooth speakers..
Connects to any powered speaker, stereo, or home theater receiver that has a 3.5mm input jack or an RCA jack (3.5mm to RCA cable converter may be required). Plays streaming music from Amazon Music, Apple Music, Pandora, SiriusXM, Spotify, iHeart Radio and more on a Bluetooth speaker or connected audio system. Microphones are built-in for questions or commands, even when music is playing. The Echo input also works with the Alexa Whisper Mode. Using Alexa voice commands, you can tell the Echo Input to play music, read or play the news, check the weather and traffic, answer questions, set alarms and timers, add items to a to-do or shopping list, and control compatible smart home devices by adding the appropriate Alexa Skill(s). Voice-only phone calling and the Alexa Drop-in feature only works when the Echo Input is connected to a speaker or audio system using the cable connection option. According to Amazon, calling and Drop-in features do not work when using the Bluetooth connection option. With Alexa, the Echo Input can communicate with and control other Echo and Fire TV devices. There are no volume controls on the Echo Input. Alexa can control the volume that comes from the Echo Input, but the powered speaker or audio system it is connected to has to provide its own volume control. If you tell Alexa to turn up the volume, but your external speaker or audio system's volume is turned down, you may not hear anything. Set the Echo Input to output a constant volume and adjust the main volume using the controls on your external speaker or audio system. Plug the Echo Input into AC power using the provided adapter. If you have't already done so, Install and open the Alexa App on your Smartphone (Android or iOS). In the App menu, tap the Devices Icon on the bottom right, this will take you to the Devices Menu (refer to the image in Step 4). In the Devices Menu, tap the "+" icon on the top right to select the Echo Input from a provided list. Connect Echo Input to Wi-Fi per app prompts and wait for confirmation that the Echo Input is connected. You may have to enter your Network password. Choose the method (Aux cable or Bluetooth) you want to use to connect the Echo Input to your External Speaker or Stereo/Home Theater receiver. If Bluetooth is selected you'll be prompted to proceed with the pairing procedure for your Bluetooth speaker. Tap continue and start interacting with Alexa and listen to music. If using a wired connection, make sure your external speaker or audio system is turned on and the designated input is selected. If the Echo Input is, or becomes, unresponsive, you can reset it by pressing and holding the Action button (refer to the technical details diagram below) for 25 seconds. You then have to go through the initial setup process again. Space-saving slim design (smaller than the Echo Dot). Adds Alexa voice control and streaming music services to Bluetooth and non-Bluetooth powered speakers, as well as older stereo and home theater receivers. The same Alexa voice interaction features as other Alexa-enabled and Echo smart speaker products. A connected Bluetooth or wired powered speaker, stereo, or home theater receiver always has to be on to hear Alexa voice responses. Can't use Bluetooth and wired connection options at the same time. Can't activate Bluetooth pairing by voice command – must initiate through Alexa app. No digital optical audio output connection option. Does not work with the Alexa Voice Remote for Amazon Echo. The Echo Input is a stripped down version of an Echo Dot that requires an external speaker for you to hear Alexa responses or music. The Echo Input is best used with powered speakers and audio systems that can be left on all the time. Turn off any standby, power saving, sleep, or auto on/off features so Alexa can respond to as needed. Echo Dots have built-in speakers but can also work with external speakers just like the Echo Input. Both devices work wirelessly with Bluetooth speakers, as well as powered speakers or stereo/home theater receivers with an available Aux input. If you want all sound, including music and Alexa voice responses, to come from an external speaker or home audio system, rather than from your Echo device, then the Echo Input might be right for you. 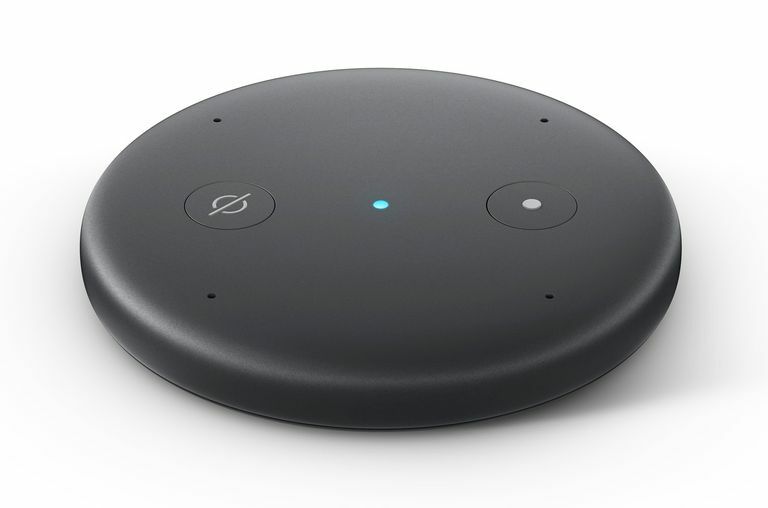 The Echo Input is available in black or white, and, at about $35, is $15 less than the standard price of the Echo Dot ($50).